Smart, interest, and active women, part of the TTN community across 13+ chapters and national, are embracing new interests or fully re-inventing themselves after leaving professional careers, making geographic moves and dealing with changing relationships, housing, and health. As Dr. Erica Miller states in her book Chronologically Gifted, "chronologically gifted is an individual decision and choice." TTN women have made the choice. Now that you're here, make sure you find, "like" and follow us on Facebook (each chapter has their own page), on Twitter @TTN_50Plus, and LinkedIn. Visit our website to get the latest on chapter activities, local and national events and articles of interest. 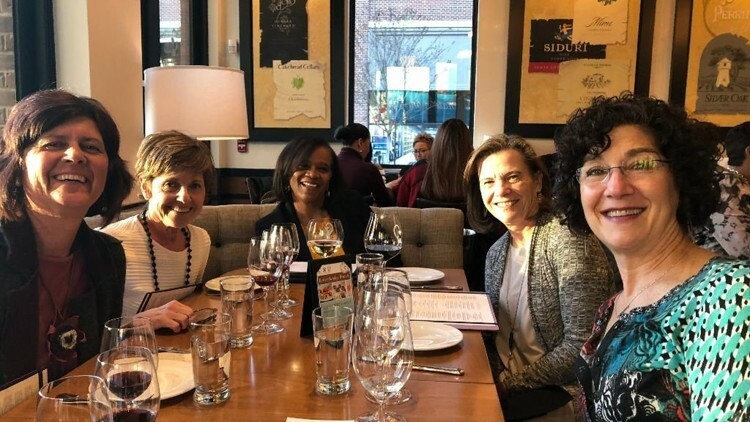 This past summer Gail Collier (pictured above with fellow Atlanta TTN’ers) reached out to Gracie Bonds Staples at the Atlanta Journal-Constitution, which resulted in This Life with Gracie: Women Redefining Retirement, prominently featuring Gail, founding chapter member Rhoda Margolis, and TTN. Ms. Bonds Staples’ article was subsequently picked up by Newsday, a Long Island, New York newspaper and The Hartford Courant. We could not have asked for better coverage of The Transition Network and all we offer to women 50+! Thank you to all of our chapter leaders who do such a great job reaching out in their communities to spread the word about TTN!